Yet another set of old data, well, what can you do when it's cloudy and cold. 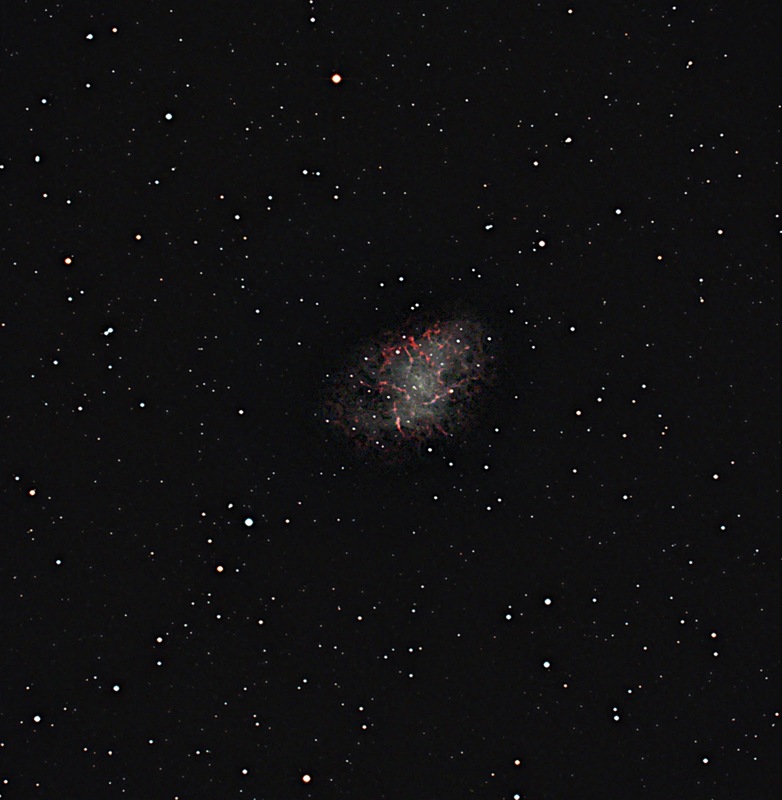 This time M1, taken on 22.11.11, with the M25C and the Vixen260 and the AP .67 focal reducer. 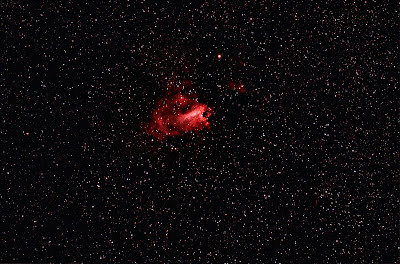 Acquired with Astroart, stacked by adding in Astroart and finally processed in Photoshop. The exposure was 30x120sec unguided. 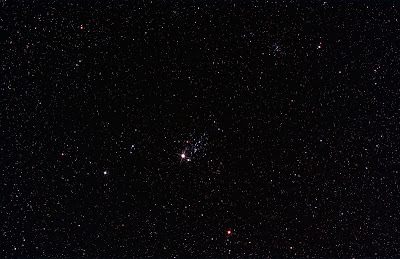 Another set of old data, this time of the ET or Owl Cluster in Cassiopeia, sometimes known here as the Chicken Cluster. Taken with the M25C in my old William 98. The exposure was 20x60sec, calibrated with a Masterflat and stacked by average in Astroart. Finally processed in Photoshop CS6. 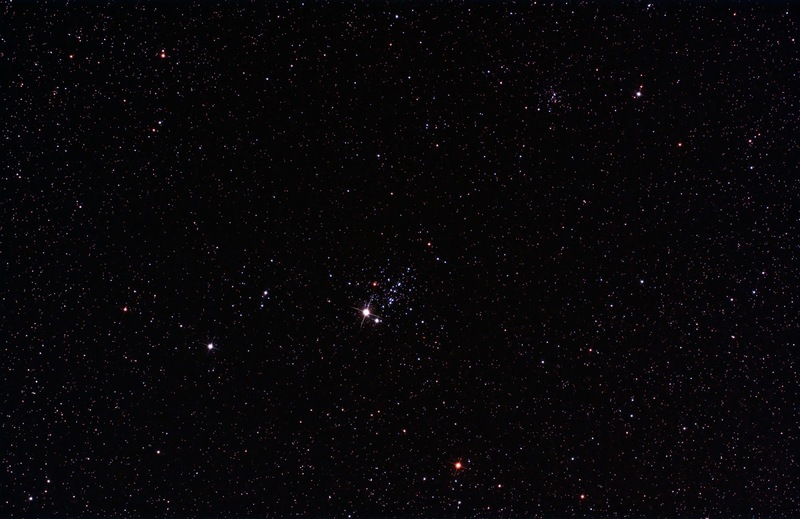 NGC457 is in the middle, and to the upper right is a smaller cluster NGC436. Both were discovered by Herschel, when light pollution was unknown but telescope mirrors were made of Speculum metal reflected only some 66% of the light they received, so in his early days when he used a diagonal, he'd get only 30-odd% of the light, and that only while the mirrors were new and untarnished, which they did quite quickly. 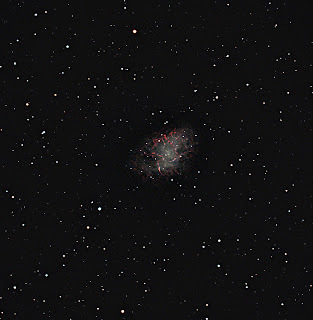 This is an old set of data taken with the M25C and William 98 sat on the AP 900GTO on 23.6.09. The telescope has long gone, nice one though, the M25C is still here, as is the mount. It was guided by an H9C on the Vixen 260, that has been replaced by the ODK12. The data was acquired with Nebulosity and calibrated in Astroart. Final fiddling was done in PS CS6. The exposure was 13x300sec. 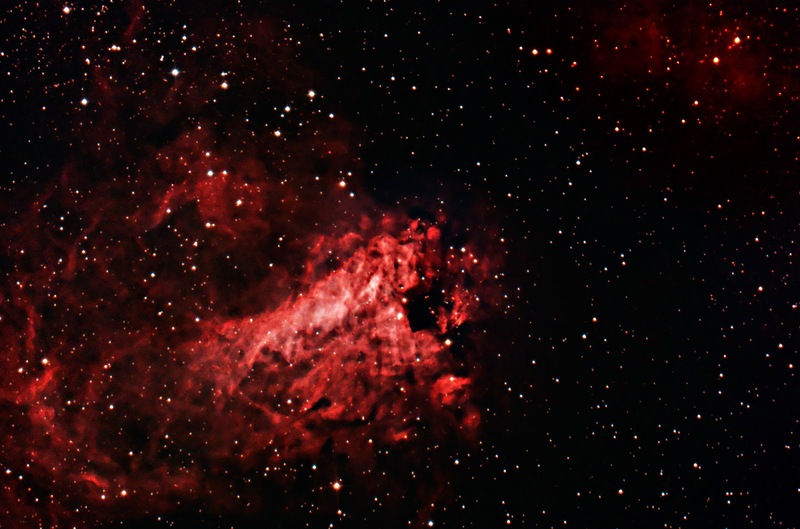 In the middle is M17, the Swan or Omega, with close by, and a little to its upper right a pair of nebulae IC4707 and IC4706, just 3 to 4 arcmins in diameter. Occupying the whole of the bottom right corner is the scarcely discernible nebula IC4701, some 60mins in diameter, and in its left hand edge is the very sparse cluster NGC6596. All this, of course, in the busy area at the top of Sagittarius. This second one is of the same subject but taken on 16.6.2010, with the same camera, but through the Vixen 260, whose focal length was 3000mm, whereas the William FLT98 used for the one above had a focal length of 618mm. The exposure was 38mins, made up of some 120sec and some 300sec frames, unguided. Astroart and Photoshop were used for processing.